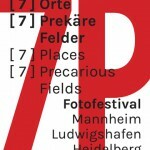 Fotofestival is now known as Biennale für aktuelle Fotografie. More than 2000 years ago, the Greek poet Antipater of Sidon listed the Seven Wonders of the Ancient World, the seven most splendid structures of his age. All that remains from across the centuries are the Pyramids of Giza; all other wonders of the world have fallen victim to the gnawing of time, to acts of destruction and disasters. Yet, seven new world wonders have been created since then: the Great Wall of China, the rock city of Petra, the Inca ruins at Machu Picchu, for example. In addition, we could note the seven world wonders of technical development, the seven wonders of nature, the seven wonders of the Modern Age or the seven steps to personal enlightenment. We humans create wonder. We are capable of doing so. At the same time, though, we experience the decay of our own achievements, and we are responsible for the destruction of others’ wonders. Even what we do not create, what we have received as a gift – nature – is so far subject to our will to modify that the consequences of the changes cannot be foreseen and are barely rectifiable later. In Christendom, the Seven Deadly Sins are listed as the reverse of good, human behaviour: pride, greed, wrath, envy, lust, gluttony and sloth. For his part, Mahatma Gandhi labelled the dark sides of human behaviour, in a more concrete and contemporary way, with wealth without work, pleasure without conscience, knowledge without character, business without morality, science without humanity, religion without sacrifice, politics without principle. We can all ask ourselves the question: What are our wonders today and what are our deadly sins? On the one hand, the number Seven is a gleaming lucky number if it speaks of strong will, outstanding strength, great achievements and of inexhaustible joy and happiness, and on the other hand it is a gloomy number of fate, a number of the abyss, a number of disasters if it tells of the debasements of human life, of the dark sides, yes, of the inferno in the world. The French structuralist Roland Barthes would listen up at this point and, similarly to his criticism of the famous exhibition ‘The Family of Man’, would make himself noticed thus: ‘Everything here, the content and appeal of the pictures, the discourse which justifies them, aims to suppress the determining weight of History: we are held back at the surface of an identity, prevented precisely by sentimentality from penetrating into this ulterior zone of human behaviour where historical alienation introduces some “differences” which we shall here quite simply call “injustices”. This myth of the human “condition” rests on a very old mystification, which always consists in placing Nature at the bottom of History.’ [i] He would challenge us: a progressive humanism would have to reverse this ‘old betrayal’, which means it would have to ‘incessantly tear open’ nature and its laws in order, finally, to place nature itself as historical. More concretely: ‘Birth, death? Yes, these are facts of nature, universal facts. But if one removes History from them, there is nothing more to be said about them; any comment about them becomes purely tautological. With this argument, which is published for the first time and readable in his ‘Mythologies’ in 1957, he puts his finger on a sore point: To speak of the seven wonders and deadly sins of the world may sound great and human, consistent and essential simultaneously, but it also sounds like eternal human poetry of the mythically entwined way of the world. The course of time purges the lived, built, hard-fought life and its concrete history of almost everything, except the remaining aesthetic stimuli, and allows us the sweet stylisation of present and past. ‘Arcadia’ is so quickly mythologised and now sounds merely like an expansive hilly ideal landscape with fragrant plants and trees; it is no longer a reminder of the two-class society of citizens and slaves and of a history full of wars and battles. This is a sore point, in many examples of photography as well. [ii] ibid., p. 101 f.
Industrial photography in the classical sense was interesting through to the seventies of the 20th century. Until that time the view camera, the tripod, big floodlights and flash systems, complex preparations and a clever retouching technique on both negative and positive print defined industry’s sharp, precise profile. In large industries there were departments with photographers, retouchers and lithographers for making photographic communication and documentation that were as perfect as could be. In the course of corporate streamlining, proprietor changes, intensified cost control, in the past four decades the visual history of many companies has been thrown away by the container-load and photographic contracts awarded internally to amateur photo clubs and externally to fast-shooting 35mm photographers. The result: visible deterioration – yes, dilution – in industrial photography. The increasing invisibility of the world of production as a consequence of technologisation, digitisation, and the relocation of heavy industries to distant low-wage countries escalated this image situation still further. But the industries continued to produce; they evolved, relocated, accelerated. Today they work with new materials, digital controls, robot-assisted production processes through to the use of 3D printers. In parallel with the ‘cultural revolution’ in 1960s and 1970s society, Western industrial society experienced an ongoing ‘high-tech revolution’ with new partnerships. ‘It is not the productive factors “work” and “capital”, not even the productivity of material and fuel resources or of resource information pure and simple that hold the key to social and economic structural change, but the productive factor “science and technology”‘. [i] Economy and society today is changing even faster as a result of the development of information and communication technology, as a result of the Internet. The revolution in information technology has reconnected space and time and thereby starkly altered the space-time ratio of the post-industrial age. ‘Past societies (…) were primarily space-bound or time-bound. They were held together by territorially-based political and bureaucratic authorities and/or by history and tradition. Industrialism confirmed space in the nation state while replacing the rhythms and tempo of nature with the pacing of the machine. (…) The computer, the symbol of the information age, thinks in nanoseconds, in thousandths of microseconds. Its conjunction with the new communications technology thus brings in a radically new space-time framework for modern society.’[ii] Whereas the old familiar form of the dirty and oily factory began to disappear from Western Europe from the 1980s onwards, a new type of factory has emerged: the showroom. In showrooms, manufacturing processes are performed like theatre plays and serve as companies’ exhibition and marketing spaces. In the West, industrial production is deliberately being introduced into cultural life. For example, with the Transparent Factory that Volkswagen has set up for production of the Phaeton in Dresden. The factory is turning into a mixture of cultural, ritual and productive location; it is becoming part of a new lifestyle marketing. Violence is cruel, in every form. Mental and physical violence damage our integrity, our existence. Bodies collide, crash into one another, burst, explode; bodies are shot at, injured, slit open, shot down, raped, mutilated; bodies are executed, hanged, beheaded, poisoned, extinguished by means of electric jolts. The body no longer steps outside, exposes itself, marries, conquers its world; rather it experiences a hefty thrust reversal. Physical, mental and emotional forms of violence attack people’s integrity, injure them, annihilate the spiritual and material body system. Images of domestic violence, of murders, of belligerent attacks, bomb explosions, executions, mass exterminations, of ethnic hatred and of structural, social violence, of state power pervade our life – and our visual life. Architecture has always been a great and heavily debated scene of zeitgeist, world view, everyday life and aesthetics. It is the bold materialisation of private and public visions, applied art and avant-garde simultaneously, and it is also, as Slavoj Žižek writes, ideology turned into stone. The history of buildings designed by architects trod the path in the Western world from the squat, coarse, thick-walled volume to the wafer-thin, smooth, elongated or elevated, at any rate starkly extended body. Old houses in the Engadin region, for example, often have walls of an incredible thickness of one to two metres, as though required to withstand landslides and avalanches. Steel-and-glass buildings, on the other hand, are often so delicate that interior and exterior can barely be distinguished now, so delicate that the inhabitants inside have a sense of the outside and swap the cosiness of being embedded for the feeling of being exposed. Only the thickness of the laminated glass now separates the worlds. The most radical attenuation of the building occurs in architectural illustration. Voluminous physicality is contrasted by these architectures’ (ultra-flat) images. Architectures have been devised, drawn, dreamed up and, since the medium’s invention, endlessly photographed. The first photographs were, all of them, architecture images. Architectures experience through images a second, a parallel life. Before, during and after their existence images talk about them, superimpose them with thoughts, fantasies and ideologies. Over the centuries buildings have become ever more slender, until they were quite delicate, until they were transparent, almost like their inhabitants too. But only the images dematerialise the architectures entirely, remove their substance and reduce them to form and sign. Oliver Wendell Holmes’s euphoric call at the beginning of photo history, to photograph the world so that we can experience it without matter and to burn down the world afterwards, is becoming, particularly in the digital, virtual, media-based world, a form of ‘reality’: The long path from substance to surface, from matter to symbol, has been trodden – even without the destruction of matter, which for Holmes was imminent as the final corollary. The ‘Urbanism & Real Estate’ topic deals with various developments undergone by urban structures today. With breathtakingly fast, radical changes, for example, such as the total redevelopment of Beijing, which, laid out to plan, is causing extensive sweeps of a traditional single-storey city to shoot straight into the profitable sky. ‘Money is any item or verifiable record that is generally accepted as payment for goods and services and repayment of debts in a particular country or socio-economic context, or is easily converted to such a form. The main functions of money are distinguished as: a medium of exchange; a unit of account; a store of value; and, sometimes, a standard of deferred payment. Any item or verifiable record that fulfils these functions can be considered money.’ (Wikipedia entry) Money is a means that enables the exchange of goods to be freed from goods’ mass and volume. Money is a propellant that aids the economy and human co-existence, that helps to develop ideas, to launch production, to keep life on earth going. But now the financial system has become detached from the economic system and developed a life of its own. As there is a Dark Internet, so there is today a type of Casino Finance Roulette with gambling on a global scale and world economy as [sic: not my alteration] stake, in which ultimately a hundred times, a thousand times the value of one’s own mother, of one’s own house, of one’s own country is thrown away on long-term bets. In German, money and greed alliterate (Geld und Gier); this aligns with the circumstance that greed has become the dominant principle of late-capitalist money-management and conduct. ‘Mere’ merit counts for nothing, these days; ‘ridiculous profit’ is at stake. The digital and algorithmically underpinned power gaming (high-frequency trading) at the stock exchange is increasingly dividing the world into: very rich and poor; the middle is gradually skidding off the road. Well-established human values have been changing at great speed for decades. We can speak metaphorically here, without blushing, of the ‘pornographisation of society’, an ever further escalating, radical concentration on the abstraction ‘money’, with the willingness to do anything for it, even to cheat one’s own country, the entire world (by means of manipulation of the Libor, the reference interest rate) and to get rid of one’s neighbour (TV crime-style) using the weapon of poverty, if needs be. In the theory of the French philosopher Michel Foucault, knowledge and power constitute two closely interwoven concepts. The more extensive and detailed our knowledge, the greater become the opportunities for control and hence for power. Control and disciplinary techniques lead, in Foucault’s view, to ever-new forms of knowledge and vice-versa. The 19th century saw the development of numerous schemes for identifying, classifying, measuring and calculating objects and persons. Practices of surveillance, confession and documentation set up the individual as a describable and analysable object. This development has accelerated and intensified with new techniques of monitoring, archiving, collecting, analysing and networking data. The knowledge society is the new class society; the digitisation of the world is driving a world of equals among equals into a new world of billions of singulars. This is opposed by our own, individual interest in knowledge, which creates for us a meaningful order in our life in the larger context, world. Attentively we try to avoid blending the two epistemological interests. Yet how, as the production and transfer of knowledge these days is performed mainly via the Internet, which is algorithmically set up and analysed? The individual is being celebrated as probably never before in human history. Every single person is a superstar. With old styling the Ego is actually [shaped], with new styling it is virtually shaped, enhanced, Facebook-liked, surrounded with many friends. The education network [I had translated Erziehungsnetzwerk slightly more accurately – I think – with upbringing network] allows us to grow up as frustration-free as possible; the social networks promise the Ego persistently great attention. The Ego is celebrated, tuned, elevated – until it falters, until it doubts, until it breaks. Until real and imaginary, inner and outer reality fall apart. We are currently living in a highly narcissistic world, in which community, community spirit, the notion of being part of a whole is being outshone, cross-faded by the possibilities of ‘enhanced realities’, by aggrandised self-perception in the social media spotlight. The selfie is an obvious symbol of this. What made small beginnings in the Nineties has since then spiralled upwards. The image is a new assurer of identity, new central communication tool. Rank in the ‘Like’ competition is measured against (self-) image. In a personal and cultural sense too, I can put together and modify my identity out of free-floating and artificial images and other signs entirely at will. In the form of a collage of decidedly non-natural, often also apparently contradictory properties and ‘surfaces’. (At least) on the Net, respectively in the image, I can detach my desired identity from my everyday identity (and also from my everyday body) almost at will and embed it in a new online narration. These sign-identities relate, in their turn, to other sign-identities, therefore to images and not to referents, to bodies ‘in the real world’. We are ranging, therefore, increasingly in the ‘Imaginary’. (Lacan). Photographic images are the most important new sign form during the creation and modelling of post-modern identities. Identity politics, still carried out with and on bodies after the war, has become a new ‘identity politics’ with and on the sign, on the image of the body, of being. It is becoming a game with signs. Is what used to be an absolutely central root of identity, like (biological, national, ‘analogue’) origin, really dissolving itself entirely in the digital at the moment? Alternatively: Is there a new origin and identity from and in the digital, that is to say, in the reproducing of codes and in the citing of cultural signs of all kinds? Is there a reliable place, or only the sign-world’s hovering, floating, sliding, bi-polar bouncing on the Net? Erstwhile conversation is turning into communication, an equally hidden, aloof and highly intensified flow of self-statements and copied statements. Erstwhile communities are turning into social networks, untethered binds that suggest proximity and create distance. A twitching, sparkling high-voltage current in times of substantial emptiness. Signs of dissolutions of values, of structures, of societies, of correct functioning are reacted to with swift, sweeping, permanent control. Surveillance under the banner of commerce and under the banner of political control. Everything is registered, communicated in networks and archived. Although it had already been ‘around’ for a while, ‘Internet technology’ became commercialised and public only at the start of the 1990s, but when it did the process was very swift. Not least because politics (especially US politics) was no longer preventing public use by means of bans and other objections. After the end of the Cold War, technology ceased to be a strategically important factor. Important steps on the path to digitisation of the image (as an element of the ‘digital’): Start of the 1990s: Adobe Photoshop; start of the 1990s: first digital cameras on the market; 1998: launch of Google; 2001: launch of Wikipedia; 2002: first mobile telephones with camera function; 2007: first iPhone with a still very basic 2-megapixel camera. However, for many, taking photographs and uploading/sharing began to practically coincide as a result. Images spread very rapidly and usually via the immaterial/electronic route. Effectively reinforced, duplicated, multiplied still further as a result of dissemination in the emerging social networks; 2002: Friendster; 2003: MySpace; 2004: Facebook (prototypes); 2004: Flickr; 2005: YouTube; 2006: Twitter (as Social Networking platform); 2010: Instagram. A line from the Nineties in the observations of theorist Florian Rötzer is decisive: ‘Deception is the innermost principle of technical images, their realism always a self-deceit. (…) No more subjugation to the object, the given light, the existing colours.’[i] – No more subjugation to the object, the given light, the existing colours: there can be no better description for the inversion of the principle of modern, respectively modernist photography into post-modern digital photography. The world outside determines the image of the world today far less than do imagination, the photographer’s interest and, possibly, the interest of his clients. ‘Welcome’, Jean Baudrillard, the theorist of the simulation, of the simulacrum, would call to us here. Welcome to a visual world which is detaching itself from the referent, from reality itself and is building its own, self-referential realm. In piecemeal abstraction from the real world, into a field of signs which now refer only to other signs. ‘Images have become scattered migrants, which are obliged to get together in new networks and swarms, regularities. Former patterns of classification and “pacification” are failing. Clarities are deceptive. The dominant guiding metaphors are reproduction, dislocation and circulation instead of uniqueness, coherence and localness.’ [ii] With a conventional sense of recognition and order, this description reads like the analysis of a critical, precisely precarious, condition. In this context, precariousness of images, mind you, for now, but perhaps also of our state, our being.